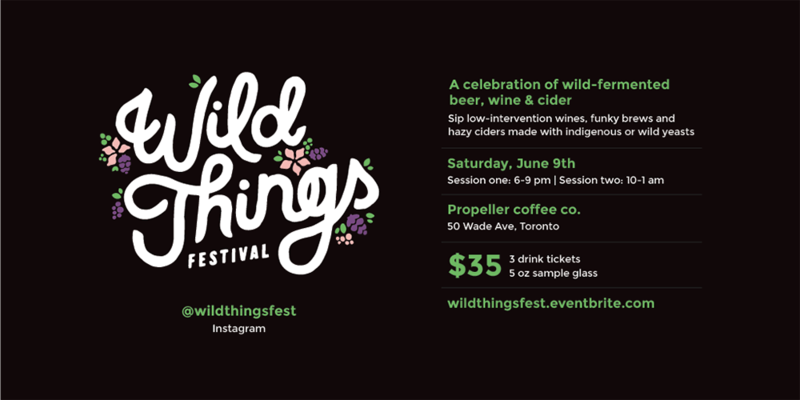 On Saturday, June 9th, Propeller Coffee Co. in west Toronto will host the first annual Wild Things Festival. There, guests will taste and sample wild-fermented beer, wine and cider. The Wild Things Festival sets out to unite beer geeks and oenophiles over the newest flavour profile in food and drink: funk. Funk gets into beer and wine through indigenous or wild yeast strains; so everything poured at the Wild Things Festival is fermented that way. The selection was carefully curated by festival founders and accredited beer sommeliers: Erica Campbell, Tara Luxmore and Crystal Luxmore. If those latter two names look familiar to Quench readers, they should be. Also known as the Beer Sisters, Tara and Crystal are frequent contributors to Quench Magazine and our Notes (specifically the Beer and Cider section). Wild fermentation isn’t new. We’ve seen it pop up at Toronto’s Grey Gardens, where they pour natural wines and funky ciders. In fact, natural wines are trending in New York City. Experimental cideries – think Guelph’s Revel Cider Co., and Hamilton’s West Avenue Cider House – consistently of natural yeasts; and beer geeks have been flooding to Beau’s Brewery offshoot, Halcyon Barrel House, for their wild-only fermented brews. At the Wild Things Festival, guests will experience 15 Ontario craft beers and artisanal ciders as well as natural wines, sourced from around the world by The Living Vine, a biodynamic wine importer partnered with the festival. A Wild-Fermented Craft Cider Bar, hosted by media sponsor Toronto Life, provides another layer of enticement for cider fans. For the foodies, there will also be a “Fermented Farms Market” featuring wild food and indie designers, and a southern-style barbecue by Uncle Smoke Cookhouse. Wild Things Festival tickets are on sale now on their Eventbrite page. There are two sessions – Session 1 from 6-9pm and Session Two from 10pm-1am. Tickets are $35 and include a souvenir tasting glass from sponsor Stoneycreek glassware and three drink tickets.